Happy Friday everyone! Keeping my look simple today wearing my favorite flared jeans, a black tank, and layering my favorite gold jewelry. Throw on a blazer if the night gets chilly, and I'm good to go! I received my second Rocksbox set in the mail yesterday and couldn't be happier! You would think that my Rocksbox stylist is my best friend by the jewelry she picked out for my set. In my box was this Gorjana shimmer ring, a Sophie Harper pendant necklace, and Perry Street crystal studs. They all work perfectly for layering with my everyday jewelry, and honestly, I want to keep it all! (Ps, I ended up buying the X ring from my last box because I loved it so much!) If you're unfamiliar with Rocksbox, it's a subscription jewelry service where you can rent designer jewelry for just $19 a month. You can read more about Rocksbox here, and see my first box review. I am obsessed with this service and recommend that any jewelry lover try it out. Best yet, my readers can get their first month free by using the code: thomasrachaelxoxo. Does everyone have fun Labor Day weekend plans? For once, I actually don't have plans, and am very excited about it. I'll try to have one day at the pool or beach, and I'm sure we'll do a family BBQ, but otherwise our weekend will be quiet. I have a non stop month ahead, as I have something planned every weekend, so a long, relaxing weekend home sounds perfect. I wish everyone a great weekend, and thank you for reading! I like this look very much! The pants fit you perfectly! The top is so cute! I love the delicate necklaces.. You look very pretty! Love this look! Your jeans are amazing and your jewelry is gorgeous! Love this look! And all of your jewelry is amazing...that gorjana shimmer ring is so pretty! Wow, that's such a cool outfit, I love it and you look gorgeous! Great blog! Love the chic and simple outfit in blue and those shoes are really pretty. You look great girl! Such a fierce outfit, looks great on you! Love those jeans! This outfit looks stunning, you look great! perfect for your figure. You have a stunning figure. Gorgeous, chic outfit. Love the flares! What a chic look. Your jewelry is so pretty too. Great look! Have a great long weekend! Very stylish look! I like your outfit! So in love with those flares! They look amazing on you! 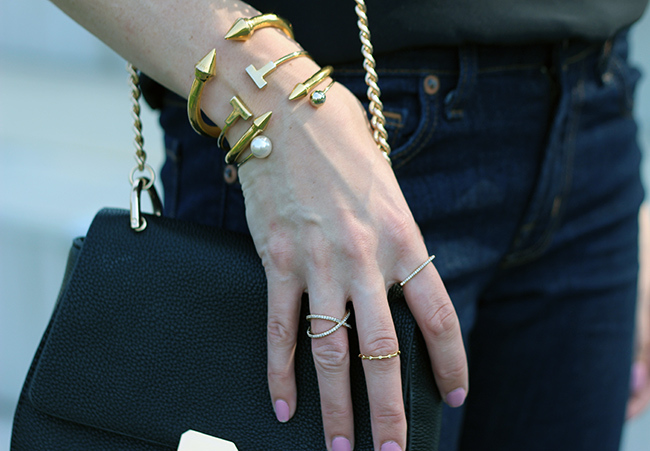 So cute with your Rocksbox jewels! I love your outfit, it's simple but very elegant. exactly how I like it!!! You are seriously ROCKING those flares! I just love them on you. The simple black blouse is perfection, too. If you have a second, I would love to hear your thoughts on my latest. Those flares suit you so well and that ruffled camisole is beautiful. I love, love all of your jewelry especially the bracelets and dainty necklaces.